James William Alston served in the U.S. Army during both the Spanish-American War and World War I. He was one of the first officers to be trained at the newly created African American officer's training school created at Fort Dodge, Iowa in the spring of 1917 and served as a First Lieutenant in the Army's 372nd Infantry, an all-black regiment, during World War I.
James William Alston was born in Wake County, North Carolina, on January 16, 1876. He attended common school for two years, followed by two years in a normal school. Alston would attend the historically-black school St. Augustine’s School in Raleigh, North Carolina, but he did not graduate from that institution. When the Spanish-American War broke out, Alston enlisted in the U.S. Army. Alston served with the 48th Volunteer Infantry, U.S. Army, from October 1898 to June 1901. Around 1907, Alston went to work for the North Carolina Department of Agriculture as a janitor and messenger. The Department of Agriculture housed in the early 1900s the State Museum (present-day North Carolina Museum of Natural Sciences), to which Alston was assigned, working for $480 a year. 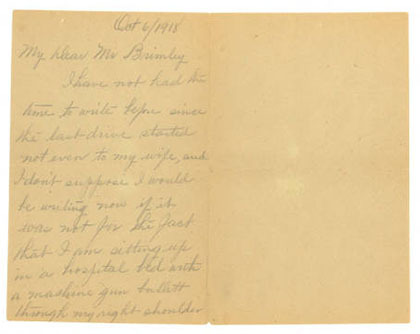 When Alston was posted to Europe in World War I, he would exchange letters with Herbert Brimley, then director of the State Museum. James Alston re-enlisted in the U.S. Army on June 15, 1917, after the United States entered World War I. Now forty years old, Alston was sent to the first all-African American officers’ training school at Fort Dodge, near Des Moines, Iowa. On October 15, 1917, Alston was commissioned as a First Lieutenant in the 372nd Infantry, 93rd Division, U.S. Army. Alston served overseas from March 30, 1918, through January 19, 1919. Upon arriving in France, Alston was sent to one of the British Army’s training schools—the Fourth Army Infantry School—where he attended a five-week officer’s training course. He would serve under French command in the Meuse-Argonne sector, and later the Meuse-Argonne Offensive, in France. In an October 6, 1918, letter, Alston mentions that he was lying in a hospital bed either in France or Belgium, with “a machine gun bullet through my right shoulder.” Evidently, Alston was also severely wounded on October 24, 1918. He returned to the United States in January 1919, and was discharged in February 1919 without any disability being listed. Alston returned home to his wife and their daughter, and began work as a messenger and clerk in the Revenue Building for the North Carolina Department of Buildings and Grounds. James W. Alston died on December 14, 1940, in Wake County, North Carolina, and was buried in the Raleigh National Cemetery (United States National Cemetery located in the eastern part of Raleigh, North Carolina). James W. Alston Papers, WWI 15, Military Collection, State Archives of North Carolina, Raleigh, N.C.
Iowa Public Television. Black Officers at Fort Des Moines in World War I. http://site.iptv.org/iowapathways/mypath/black-officers-fort-des-moines-... (accessed February 1, 2017). Barbeau, Arthur E., and Florette Henri. 1974. The unknown soldiers; Black American troops in World War I. Philadelphia: Temple University Press. Wilson, Adam P. 2015. African American army officers of World War I: a vanguard of equality in war and beyond. Jefferson, North Carolina: McFarland & Company. Mjagkij, Nina. 2011. Loyalty in the time of trial: the African American experience during World War I. Lanham: Rowman & Littlefield Publishers, Inc.
James Alston to H. H. Brimley, October 6, 1918. Item alston_19181006_0001, James W. Alston Papers, WWI 15, Military Collection, State Archives of North Carolina, Raleigh, N.C. http://digital.ncdcr.gov/cdm/ref/collection/p15012coll10/id/1525 (accessed February 1, 2017). 1 February 2017 | Peek, Matthew M.